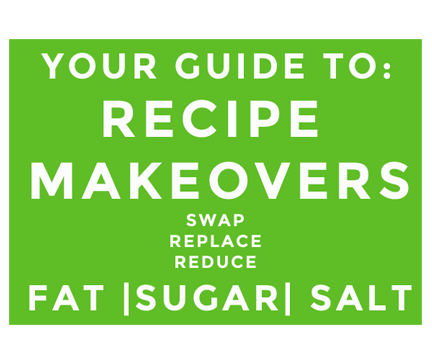 Here are our tips to reduce fat or replace fat in a recipe! 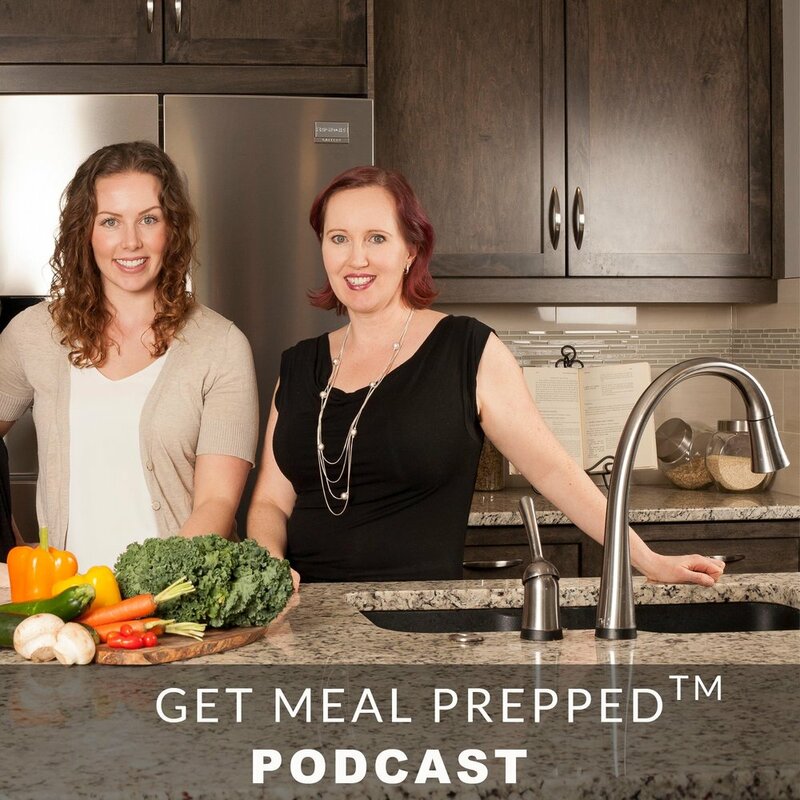 Just a quick shout out to Dietitians of Canada for some of these great tips that we are providing you today! When it comes to calories, all fat sources are fairly equal. Here is what you need to know to reduce fat in the meals you prepare. Each gram of fat provides 9 calories. This is more than double from what you get from protein or carbohydrates. Whether it’s butter, margarine, lard or olive oil, they all provide the same ‘amount’ of calories. BUT, not all fats are created equal in their nutritive qualities. Healthier fats are those you can ‘see through’ – such as olive oil, canola oil, sunflower oil, other vegetable oils. Less healthy fat choices are coconut oil, palm oil and the solid fats such as butter, lard, hydrogenated hard margarines, shortenings, fat in meat and the skin of poultry, and ghee. TIP #2: Don’t use fat to grease baking sheets or muffin tins. Really, it is unnecessary! I like to use parchment paper for everything. I purchase a big double roll pack at Costco and line most of my baking with it. My reasons are actually two fold. One, I don’t have to grease the pan, but two, it makes clean up sooo easy. Whenever I bake a casserole or bake chicken, I use parchment paper. Then the dish you are using doesn’t get as dirty, and is easily cleaned in the dishwasher. Take home message: Parchment paper is a kitchen cooks best friend. Parchment paper can be used in pretty much any situation that a recipe calls for greasing the pan. It might take a bit of snazzy snipping with scissors, but I I line muffin tins with it, bread pans, baking sheets, you name it. So when a recipe calls for greasing a pan, think parchment. The other option is to use a silicone baking sheet or silicone baking pans. I actually have silicone muffin liners, a silicon muffin mould, and really like using them. Tip #3: When oiling a frying pan use a vegetable oil spritzer, and give it a light spray. Then use a paper towel to spread the oil around. This way it gives it a really nice thin layer of oil without any excess. Tip 4: Eggs yolks have fat in them and you can reduce the amount of fat in a recipe by using two egg whites or just under ¼ cup egg substitute for each whole egg. The other thing I like to use now is a flax egg, which is 1 Tbsp (7 g) flax seed meal (ground raw flaxseed) and 2 1/2 Tbsp (37 ml) water. Add flaxseed meal and water to a dish and stir. Let rest for 5 minutes to thicken. Add to recipes in place of 1 egg. Flax eggs work well in muffins, pancakes, breads and cookies. It won’t work well for recipes that require stiffening and binding. The other new thing I have been experimenting with is called Aquafaba. This is an advanced recipe makeover move that you can play around with. It can be whipped into stiff peaks and made into things like meringues and macaroons. We feel that Aquafaba is the perfect egg replacer and is it is very inexpensive and easy to find! Tip 5: Instead of using full fat cream in soups, try thicken soups using pureed cauliflower, potatoes, carrots, lentils or tofu; or, use a lower fat milk 1% or 2% milk instead of cream. Tip 6: If a recipe calls for whole (3.25%) milk, you can swap it out for a lower fat milk or use a milk alternative like almond or soy milk, as they are often lower in fat. Tip 7: Ooey gooey cheese… sometimes I think it is just best to use less of the full fat cheese versus swapping it out to low fat cheese, but it would depend on the recipe. Sometimes a 50-50 mix is also an option. My rule of thumb is if you are mixing cheese into a recipe and the quality of cheese won’t really make a difference then go with a low fat cheese (example, inside a lasagna recipe). However, if the physical quality of the cheese will be compromised, then go with a 50% 50% mix, like in pizza.